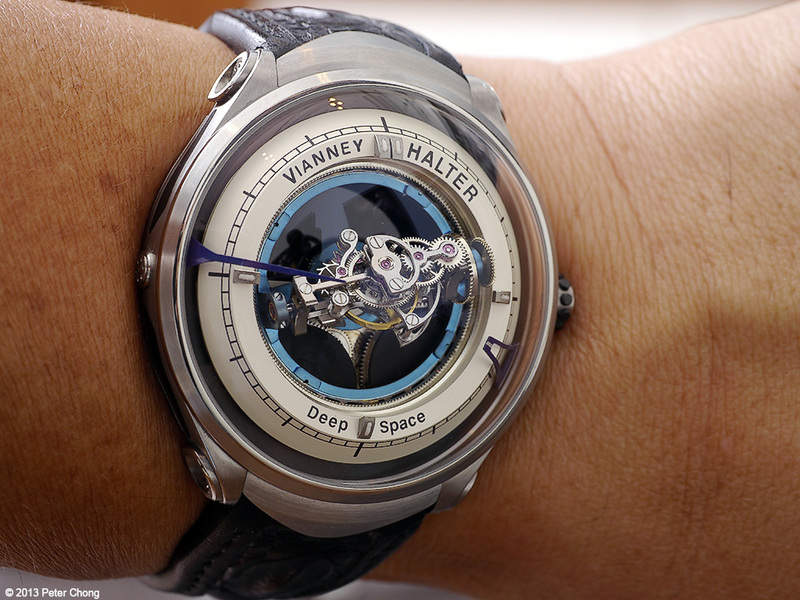 Vianney Halter is one master watchmaker whom I have the greatest respect. His mind works like no other...and his products reflect that incredible creativity. His latest project takes the form of the Deep Space Triple Tourbillon...a product of 5 years of work, which came to him in a dream. I do have a number of photographs of this incredible timepiece, so will split this blog entry into two articles. 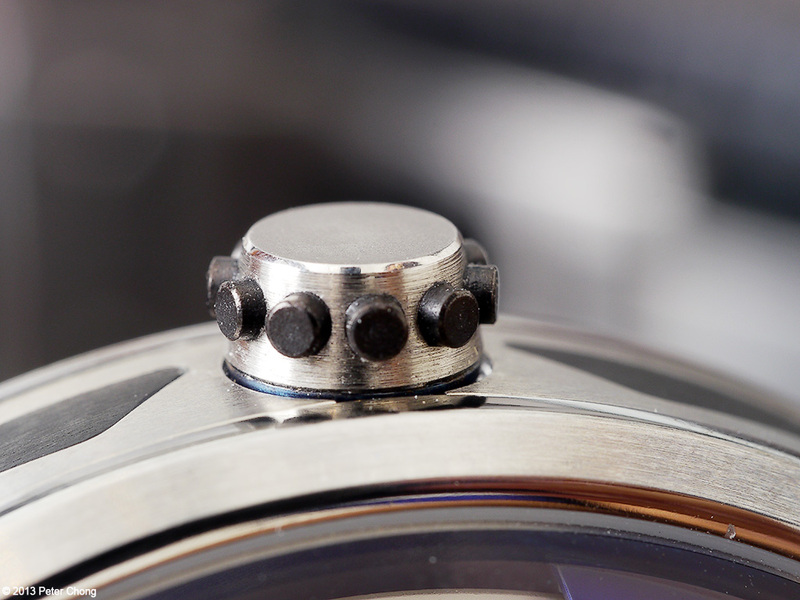 This first installment, I will show the watch, some wrist shots, and discuss some technical aspects. In the second article, I will show the extreme macro photographs. 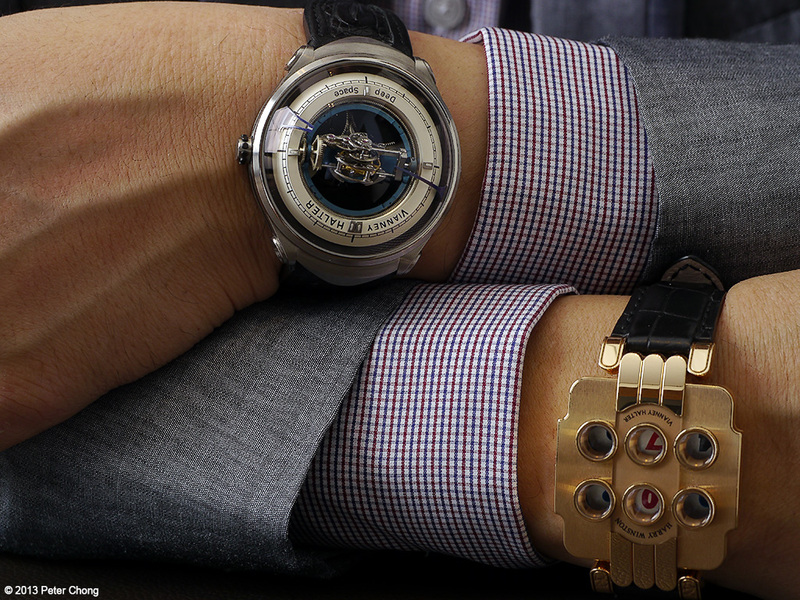 The watch...Deep Space Triple Tourbillon. Two blued steel hands lean out of the watch periphery to indicate the time...the hour and minutes. The entire movement train seems suspended, and turning on its own axis. This makes one revolution every 6 minutes. 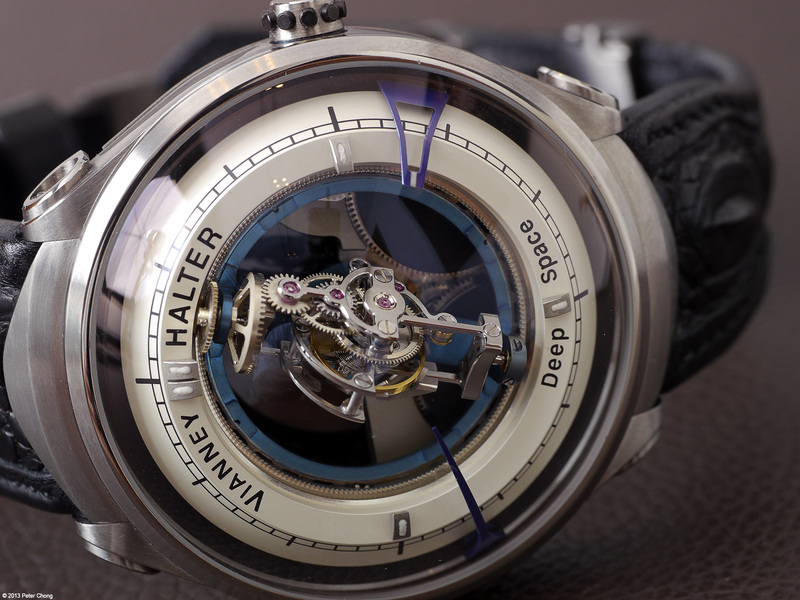 Within the train is the tourbillon. 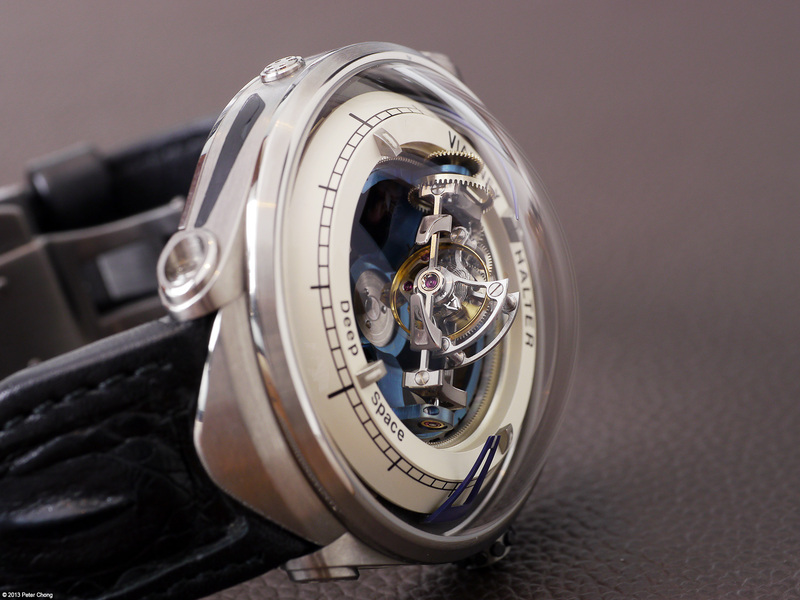 The tourbillon makes one rotation every 40s. 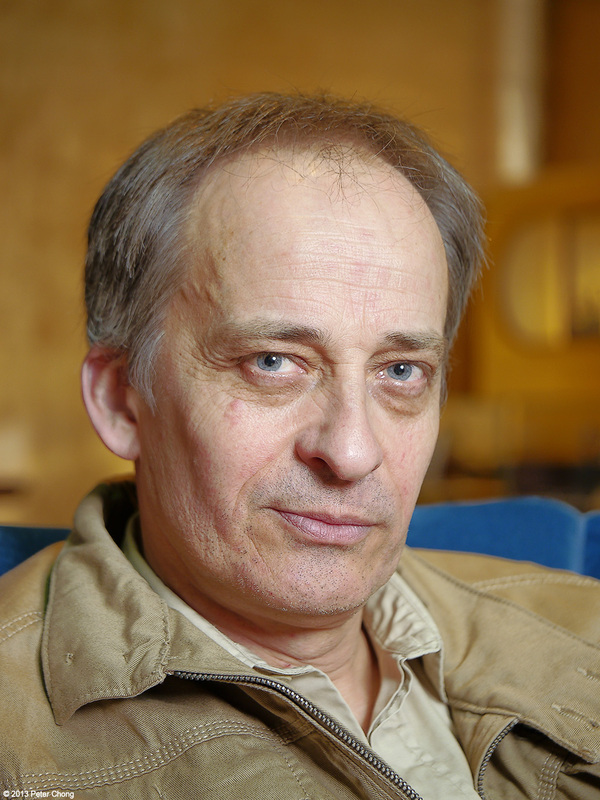 This is a special timing, to dissociate the concept of earth time with that of deep space. And finally the train itself rotates on the plane of the dial once every 30m. Making 3 axis of rotation representing our concept of 3 physical dimensions and 1 dimension of time. The case dimension is 46mm diameter and 10mm high. 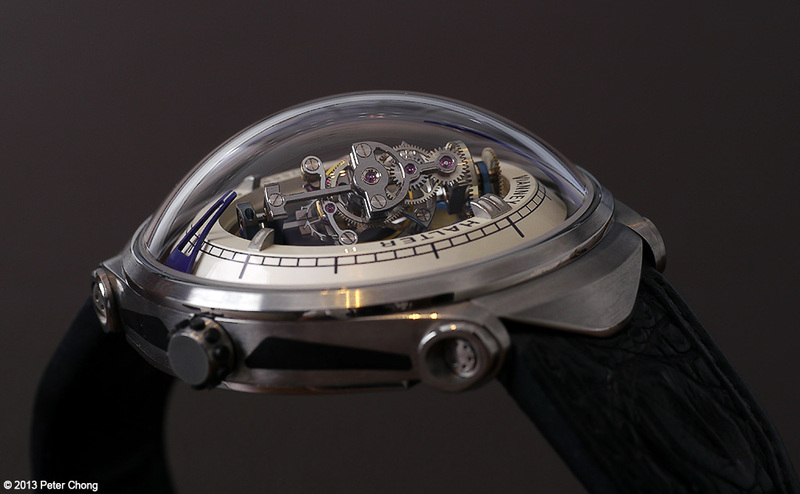 The overall height, including the domed sapphire which is 40.6mm in diameter is 20mm. Case material is titanium...a material frequently used in aerospace. The watch is very light, sits very well on even small wrists, and is comfortable. Seems a total departure from the traditional Vianney? Perhaps, but deep space happens in a galaxy far, far away...but the crown brings back the anchor to Vianney...the rivetted crown. Stay tuned for the extreme macro series next Tuesday.